This beautiful album has an unusual sound with the steel guitar being by far the most dominant instrument, apart that is from Anna’s gorgeous vocals, but there is enough variety with other melodic guitars blended into this mellow of tone stew to keep the listener rivetted! It is a very cleverly constructed sound and consequently album, which with the addition of some excellent lyrics should make it a sure fire winner. give it a chance, it’s pure musical beauty is quite captivating and will win over all but the hardest hearts. Anna’s voice is beautiful but not at all reflective of her opera background, with the album being a little evocative at times of some of the atmosphere on the Cowboy Junkies ‘Trinity Sessions’ and of Natalie Merchant’s vocals at that time. Not the same but reminiscent, and if you like that album it’s my guess you will love this. There are also at times little discernible traces of Joni Mitchell!! Often with albums that include a mellow sparse instrumentation the vocals are over dominant but on this excellent recording both are well balanced and matched in the mix. Despite that mellow tone it’s an album that probably won’t be accepted by the mainstream, needing a lot more thought and dedication to get out of the album everything it has to offer, rather than just throwaway songs! It is an easy listen without ever descending into ‘easy listening’ with the sheer beauty of the music and the powerful, at times poetic, lyrics drawing the listener in. Anyone who has ever listened to music will agree that the steel guitar is capable of great beauty but on this occasion it is matched by the depth of emotion and tone that comes from Anna’s beautifully expressive vocals. 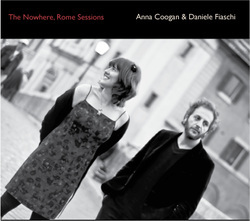 Of the nine songs, five are written by Anna, plua a co-write with Daniele Fiaschi, another co write with Evan Brubaker and a couple of beautiful covers of songs by Gordon Lightfoot and Phil Ochs. Album opener, Indian Son, is an Anna original and a lovely ballad it is as well, telling of the desire for a fresh start and a life without prejudice, and includes mellow steel guitar and acoustic guitar as well as a lovely chiming electric guitar with gorgeous vocals that drift gently away at the end of each sentence. This is followed by Red Shoes, Black Dress, a song that has a little more lift than it’s predecessor with it’s exquisitely tuneful guitars included and the steel held back on a ravishing song that shows the fluidity of love! Gordon Lightfoot’s epic The Wreck of the Edmund Fitzgerald is the most beautiful version of this sad tale that I have ever heard. It is a gorgeous haunting story song based on the true event of the sinking of the ship and loss of all 29 crew in 1975 on Lake Superior. Because it is a relatively recent tragedy the subject matter is difficult but Anna more than compensates by treating it with huge sympathy. Streamers, a co-write with Evan A. Brubaker is even slower and more haunting than previous songs on a tale of a young man who falls for a ‘fallen woman.’ Powerful and in some ways quite harrowing in it’s beauty. The extraordinary closing track, the nearly nine and a half minutes of Phil Ochs, The Crucifixion, is proof if required that this pair of talented musicians do not need a studio to produce these sparse haunting sounds, being a song recorded live at the Roepaen festival in Ottersum, Holland in 2011. The fact that I now get sent dozens of albums each month for review means I can now listen to music that in the past I would never have even contemplated purchasing. This beautiful recording is a case in point and mightily glad am I that this tremendous c.d caught my eye, to be shortly followed by my gently soothed ears!